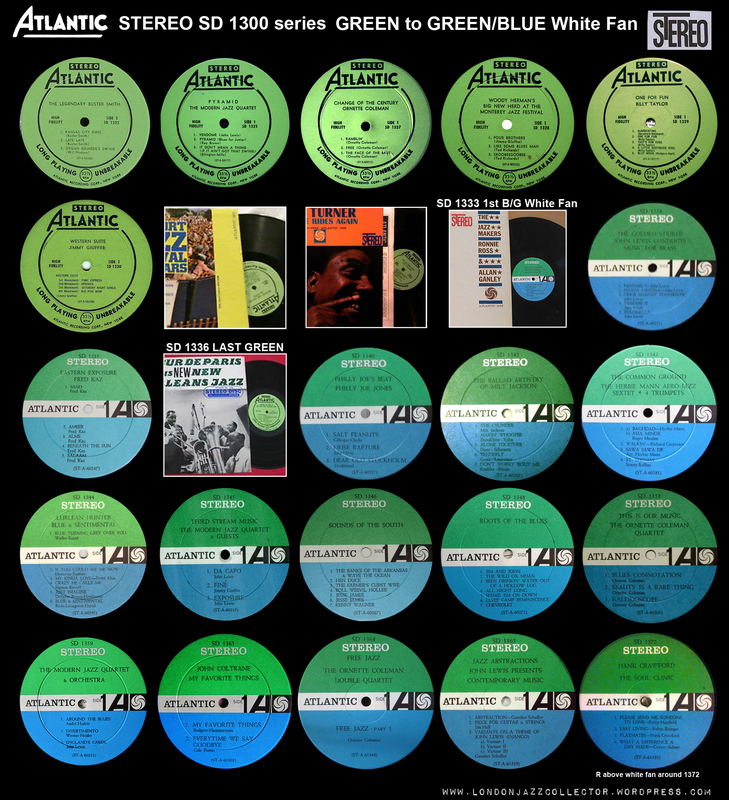 Stereo more or less follows the pattern established by mono, in which new label designs are introduced, which run as the current label for new releases, until superceded by the next, with some overlap as titles were pressed out of sequence, expected where manufacturing timing is set by various different considerations. The first stereo label is plain green, however very few copies are found of the early titles, suggesting that in 1956 very little was happening in the way of stereo, which had to wait for the later ’50s to gain any traction. The labelography below is missing many early titles as green label not found (though some appear on later labels).Observe for yourself the “intrusion” of the famous bullseye originals into the straight run of green for selected titles only.. Though discographies confidently list all the mono Atlantic titles with an SD prefix, I was unable to find many stereo copies of early titles offered on the net: if they exist at all they were few in number of sales. (The difference between written discography and actual photographic evidence!) 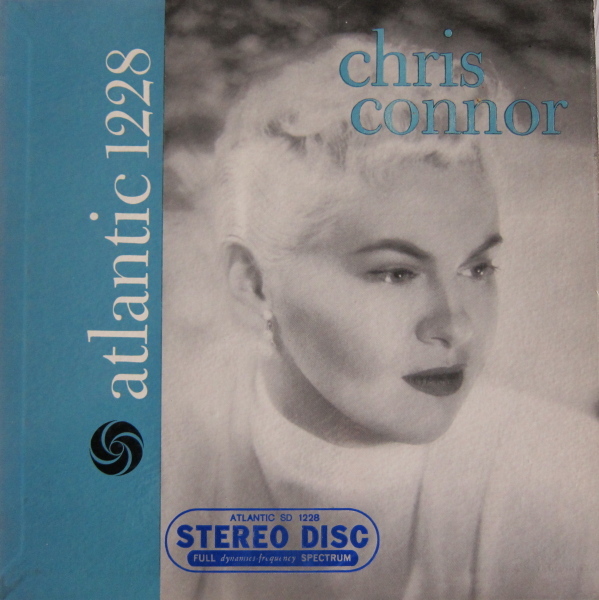 Only Atlantic jazz singer Chris Connor ( born Mary Loutsenhizer, from Kansas ) pops up with any frequency, suggesting release in stereo some years after the original mono. 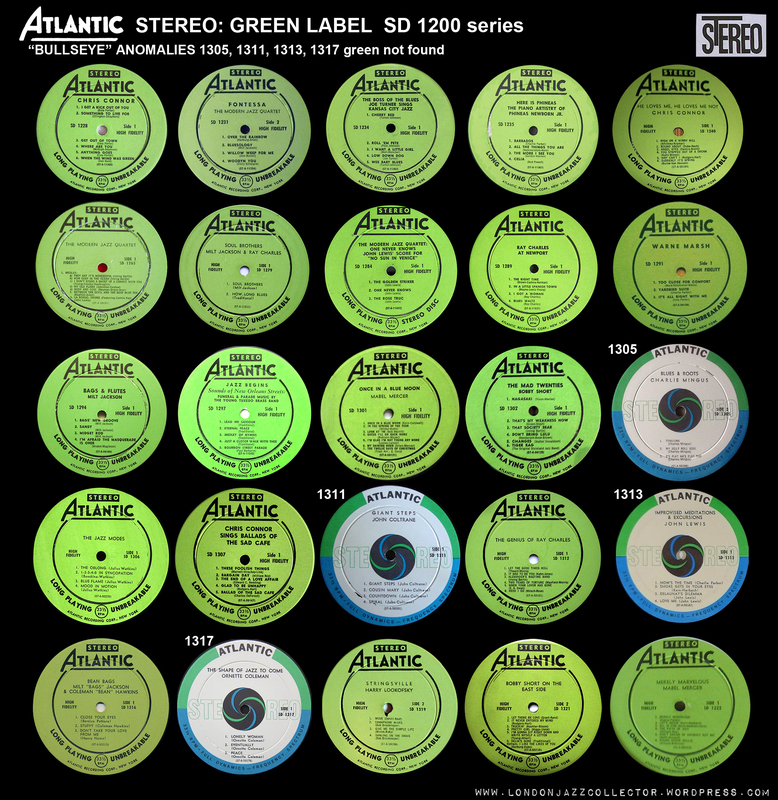 The “bullseye” label which appears in the middle of a green label run is, as with mono, a highly selective label, for specific titles, and not a general series. I can not account for why this happened, you are welcome to any explanation you can imagine. If you can find a green label of any of these, it is what they should have been issued on, according to the catalogue numbers around them. 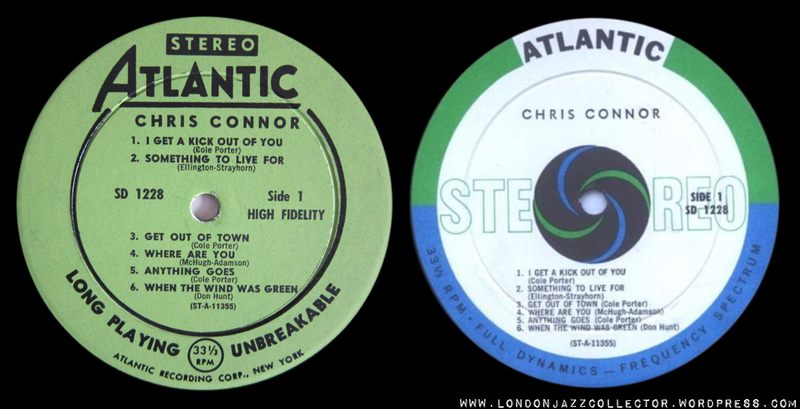 Only one “stray” title with both (original) green and stereo bullseye title turned up in this research, the popular jazz singer Chris Connor, SD 1228, with what appears to be a reissue with the same bullseye label as the above originals stereo pressings. Explain that any other way. Then stand on your head while rubbing your tummy. The green label continued in use for other titles, until eventually retired and replaced by the green/blue/white fan, later versions of which exhibit an circled “R” above the fan. 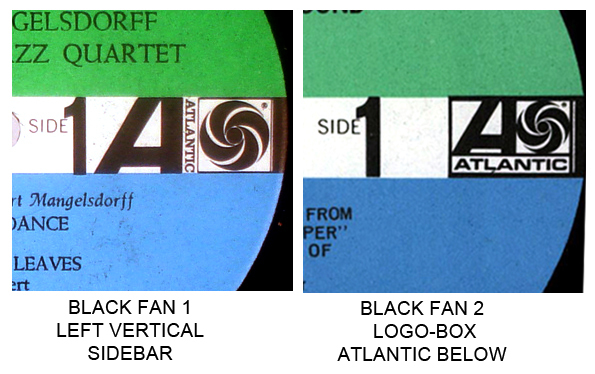 The next label, green/blue/black fan, also comes in two iterations, first with the vertical left sidebar (1962-6) , and then later with an enclosed logo-box with “Atlantic” below the fan (1966-8). Both are frequently referred to as “Black Fan” and it is not unknown for Design 2 to be referred to as “original” where Design 1 is also found. Look different separated by potentially up to six years, depending on title. 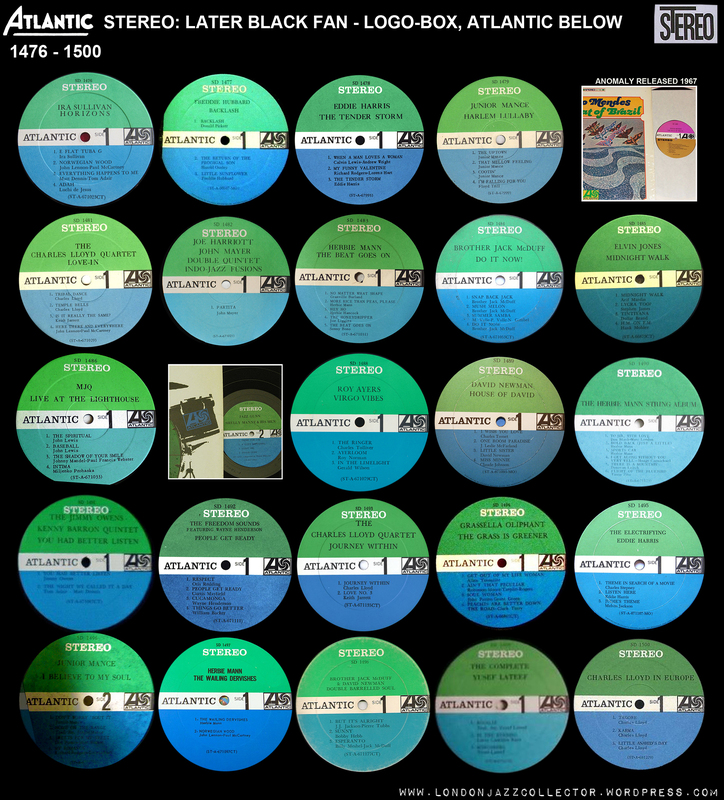 A helicopter view of titles strongly supports the contention that Design 1 was used for first pressings and for these titles, Design 2 are reissues. After SD 1466, design 2 was dominant, no Design 1 are found. 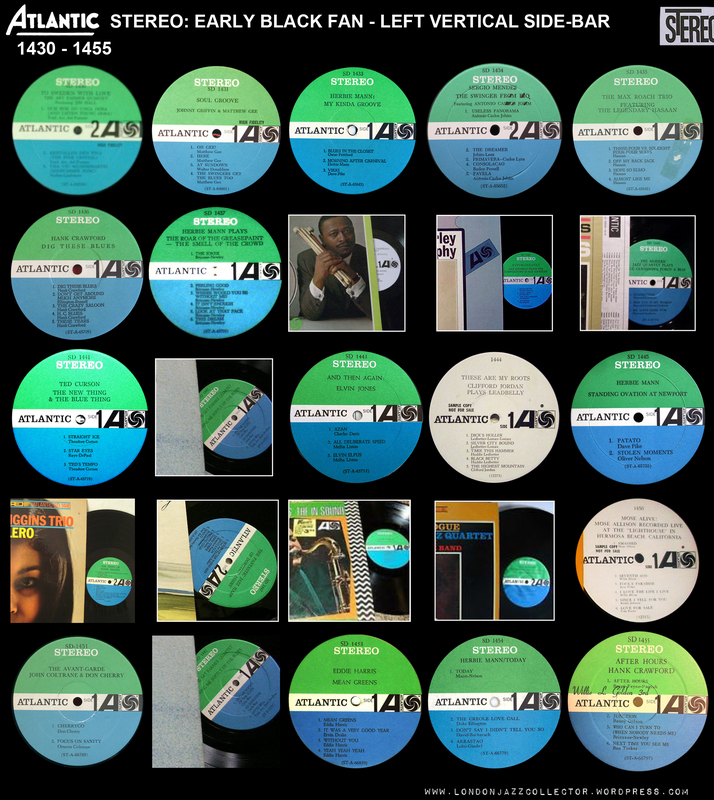 There are anomalies, which may be a function of later pressing out of sequence ie SD 1402 is found as Black Fan out- of-sequence in both mono and stereo, and SD 1418, whose pressing was two years later than its surrounding titles. Otherwise, there is a fairly continuous run of the new black fan early design. This is where it gets messy. 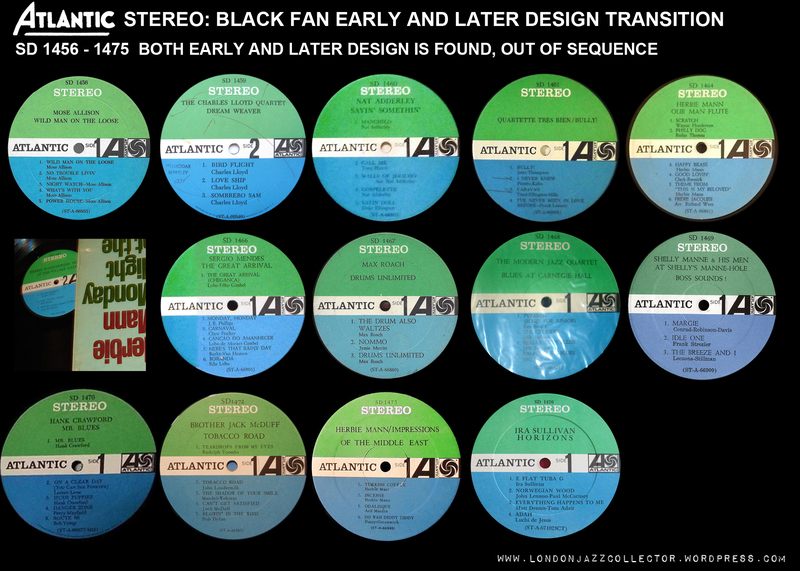 Both Black Fan designs turn up, with no visible order as the allocation of catalogue number and physical pressing are separate and not synchronous. Which is the first pressing label for any title is up for grabs. After SD 1475, the later design is established and continuous, before SD 1456 it is similarly the early design. In this territory, anything goes. 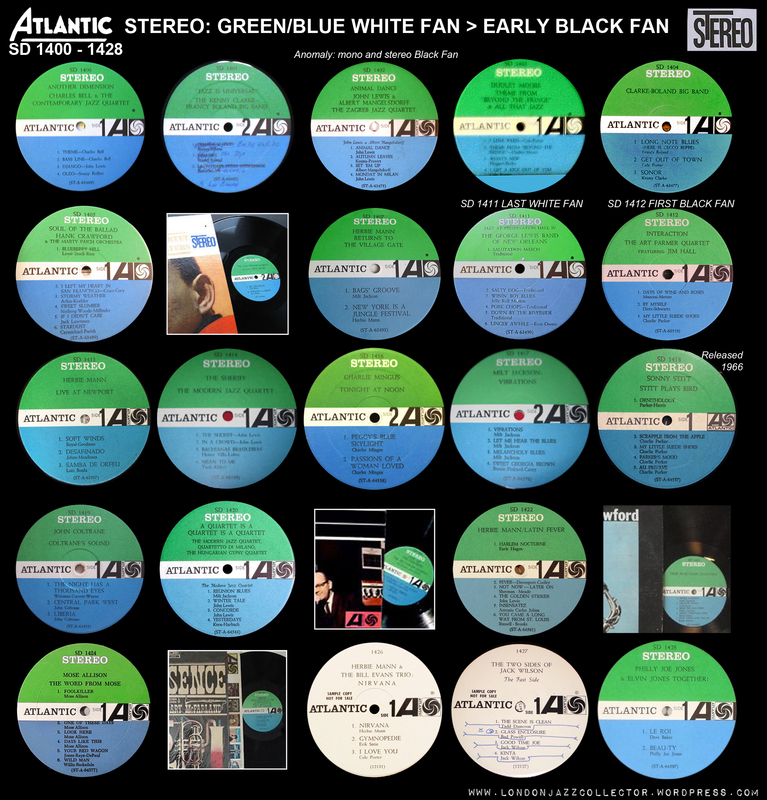 The Green/Blue/Black Fan 2 gives way to the eponymous green/orange/multicolour logo label at SD 1509, with an anomaly at “SC 1504” – catalogue numbers were pressed out of chronological sequence – something which probably happened all the time but is highlighted in transitions. From SD 1509 the future is orange. 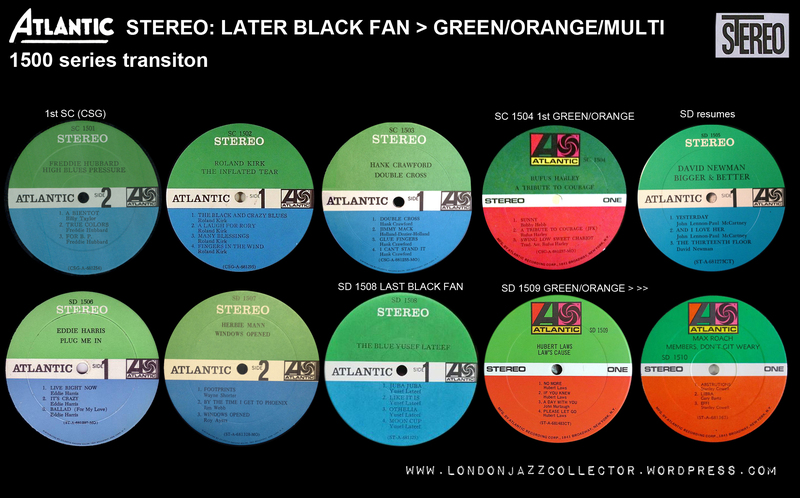 Any title below SD 1508 (exception SC 1504) in Green/Orange is a reissue, not “an original”. With the 1500 series (I’m ignoring the 8000 series as out of scope, for now) Atlantic mono ceased to exist and the stereo edition become the only edition in the US market, though mono is still found in some overeas editions, explorations for another day. What an interesting ride of discovery. Returning every now and then for a refresher course on this fascinating subject. 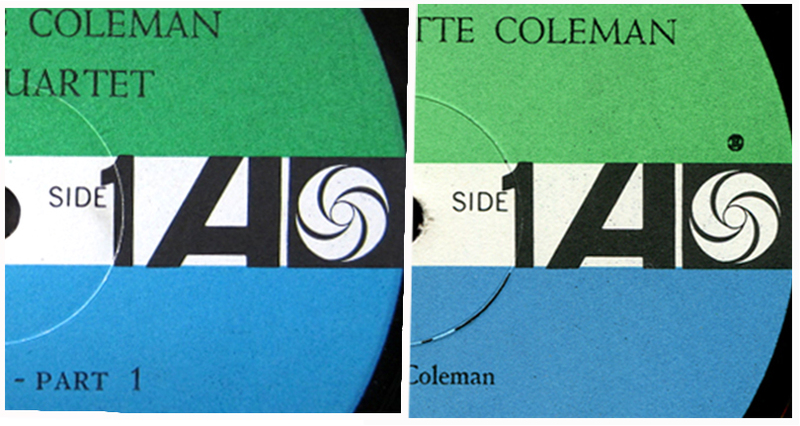 I played my stereo copy of Coltrane Jazz 1354, white fan labels and noted the Broadway adress on the cover. The inner has the 157th adress with # 1361 as the last album on top. Anyone who has ideas on a correlation between the change of adress on the sleeves and the label changes. Also, what album was the last to have a 157th adress on the rear of the sleeve? hi Rudolf and all: last Atlantic (mono) 157 West 57 is 1356, Hank Crawford “More Soul”, recorded 1960 Oct 7. 1357, Lennie Tristano “The New Tristano” is the first with 1841 Broadway address. change of label looks to have no connection with the change of address. Thank you dottore. So my copy of 1354, with first labels, white pinwheel, has got a second sleeve print. So be it. The music is great anyway. I have always preferred Coltrane Jazz over Giant Steps. The reason is the simultaneous two tones playing he introduced on this album. Harmonique! I bought a 1st Press stereo copy of John coltranes my favorite things a few years back and today I just noticed the small R with circle on top of the Black fan logo. Other than that it looks exactly like the 1st Press. So it’s a later repress? Couldnt find a match on discogs. Little confused. I believe that should be a white fan to be first pressing. I have a mono copy and mine has the white fan. Hi, I recently bought this release; https://www.discogs.com/Charles-Mingus-Blues-Roots/release/8006442 and can’t find any information about when this label was used, it looks like the mono bullseye label but it states stereo on the label. I saw on the mono page that this was the release to use new labels, was there a third variant? On the Discogs page it is mentioned that it is a repressing, which explains everything. The repressing industry very often makes silly mistakes.